Translation Studies approaches the phenomenon of translation from different perspectives. The present paper explores the relationship between translation and the tourism industry as a potential area for Translation Studies. Tourism has evolved in recent years, and allows tourism operators to benefit financially from human interest in exploring the world. Specialized translation services could help tourism operators overcome the language gap, as well as help translators to search out their best place as a part of that industry and get their due financial share of a potentially large emerging market. By presenting some facts and figures, the present paper attempts to stimulate translators to rethink their strategies in a way to foster better cooperation with tourism operators. When we view the tourism industry as a confluence of cultures and languages, the translation phenomenon—which is also interconnected with language and culture—suggests correlation. Both have inherently international and globalized perspectives, and along with the current trend of globalization, undergo their developmental processes hand-in-hand. Nowadays, in addition to leisure travels, global commercial travels have come into vogue in the tourism realm: this point necessitates and clarifies the need for providing translation services to such travelers. As global and business travel become increasingly important, the process of providing translation services in the tourism industry also gains enhanced significance. Such services would undoubtedly increase the number of tourists entering a country, leading to more income both for tourism agencies and for the countries visited. When properly focused and competently translated tourist materials are made available for a country, more diverse groups of people are likely to choose that country to explore. For instance, in comparison with leisure travelers, many business dignitaries who travel do not intend to spend much time in any one destination. To attract these travelers as a potential source of revenue, both government and non-government sectors should provide translation services specifically aimed to attract their interest in longer stays. 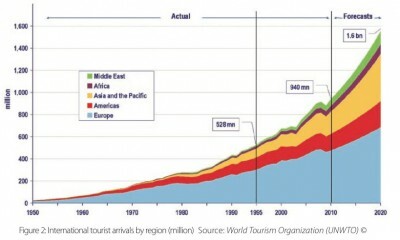 According to the advance release of the World Tourism Barometer, presented at the Madrid fair by the World Tourism Organization (UNWTO), there were 935 million international tourist arrivals worldwide in 2010, which represents an increase of 7% compared with 2009 (the year in which global tourism fell 4% as a result of the economic crisis). In 2011, growth is expected to continue at an average rate of 4% to 5%. Travel and tourism generate about 9% of the total world GDP, around 235 million jobs representing 8% of global employment, and are among the largest and most dynamic industries in today’s global economy. [i] These numbers demonstrate that the ability to offer excellent translation services to tourists directly results in an economic upswing in any country. Such services can vary from the translation of brochures, websites, tour and holiday guides, service descriptions, and instructions to audio/visual materials. It is obvious that communication in a clear, mutual, flowing, and fluent manner and method is critical if a country wants to attract tourists and maintain tourism business. To attract and build an international clientele, the language gap must be bridged. This is the point where translation plays a role. Translators, as lingua-cultural mediators who are significant actors in an effective communication network can play the mediating role that is essential in achieving effective communication. Translation of tourist materials differs from most other types (e.g., academic translations dealing with concrete texts) because understanding the culture of a country matters more here than anywhere else. Taking that under consideration, translating tourism-based texts requires an in-depth understanding of culture as well as of the tourism industry, a nuanced and precise use of vocabulary and terminology, and linguistic expertise. A translator as a mediator has to bear in mind that to render texts professionally for the tourism industry means an enhanced attraction of future tourists, thereby directly allowing travel agencies, hotels, tour operators, and governments to access more financial resources. Doing such a job requires a constant awareness of the intended audience, the types of translation materials being produced, the graphic content being provided, the possible need for localization, and the possible existence of previous translations, terminology glossaries, or terminology reference tools that may be helpful to the translation process. The overarching concept I am introducing here is touranslation: It denotes the translation of tourism texts, and the mediator here then becomes a touranslator. This concept embraces both academic and industrial connotations in that, academic-wise, it is carried out by those who specialize in a branch of knowledge called “translation” and industry-wise, it concerns itself with the tourism industry. 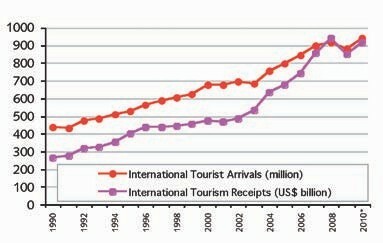 As a well-known financial resource, the tourism industry helps countries to boost their economy. It also helps countries to portray worldwide an effective image of their political and cultural characteristics. A proper translation, in addition to other criteria for effective attraction of tourists, is an inseparable component of this network. In 2010, international tourism receipts are estimated to have reached US$ 919 billion worldwide (€ 693 billion euros), up from US$ 851 billion (€ 610 billion euros) in 2009, corresponding to an increase in real terms of 4.7%. I draw your attention to the graph in Figure 2, which presents data for the financial perspective of the tourism industry [ii]: These figures should stimulate translators and those who touranslate to reach the point where they can profit from such a huge potential market. The tourism industry needs no special investment from translators; they only need to know how to play their role in this growing industry. As shown in Figure 2, the industry is poised to maintain its upward growth trend in the coming decade. to a native-like degree and should be able to render words that carry cultural connotations appropriately so that correct communication is guaranteed. Touranslation revolves around the howness of “casual speech” that is used in everyday language. Casual speech reflects the “flavor” of a country; thus, the better translated, the more “tasty” a country will seem to “hungry” travelers. » Maintain marketing strategies employed in tourism texts. Knowing that marketing is highly competitive, the strategy employed in a tourism text should set realistic goals to maximize opportunities for tour operators. Great tourism translation requires touranslators to follow tour operators’ strategy: they must be well acquainted with both tourism basics and strategies underlying specific tourism texts. » Know for whom the translations are intended. Touranslation might be general, without addressing any particular community or group. In such cases, merely accurate translation will work. But sometimes tourism texts are meant to please a specific community or group. When such is the case, a proper touranslation is localized: the tone and style of a text aimed at Turkish-speakers would vary from that of a text intending to address Spanish-speakers. Having the audience in mind, the touranslator must try to eliminate possible areas of misunderstanding by considering the lexicon and syntax of the target community’s language as well as its ideologies, value systems, and lifestyles. » Consider the delicate minutiae of the texts. After all, a tourism text carries with it quite an amount of meaningful detail; missing any one point might result in misunderstanding. A touranslator has a difficult job in that, in addition to basic translation, he/she is required to master the art of transferring details with their connotations. Ateljevic, Irena, Annette Pritchand, and Nigel Morgan,eds. The Critical Turn in Tourism Studies. Amsterdam: Elsevier Ltd, 2007. Print. Chesterman, Andrew. Memes of Translation. Amsterdam: John Benjamins, 1997. Print. Dann, Graham M. S. The Language of Tourism: A Sociolinguistic Perspective. Wallingford: CAB International, 1996. Print. Dennison, Nash, ed, The Study of Tourism: Anthropological and Sociological Beginnings. Oxford: Elsevier Ltd, 2007. Print. Hatim, Basil , and Ian Mason. The Translator as Communicator. London: Routledge, 1997. Print. Helgason, Karl Jón. The Rewriting of Njáls Saga: Translation, Ideology and Icelandic Sagas. New York: Multilingual Matters Ltd, 1999. Print. Neubert, Albrecht, and Gregory M. Shreve. Translation as Text. Kent/London: The Kent State University Press, 1992. Print. Pierini, Patrizia. “Quality in Web Translation: An Investigation into UK and Italian Tourism Web Sites.” The Journal of Specialized Translation Issue 8 (2007):3-17. Print. Pym, Anthony. The Moving Text: Localization, Translation and Distribution. Amsterdam: John Benjamins, 2004. Print. Rogers, Margaret. Word, Text, Translation : Liber Amicorum for Peter Newmark. New York: Multilingual Matters Ltd, 1999. Print. kim posted this article under Agencies, Marketing, Translation	on Sunday, January 1st, 2012 at 12:10 pm	You can follow any responses to this entry through the RSS 2.0 feed. Both comments and pings are currently closed.